Andhra Pradesh State Civil Supplies Department was originally only a regulatory department Subsequently, its activities have been diversified to include procurement of food gains under minimum Support Price (MSP), distribution of essential Commodities viz Rice,Wheat, Sugar, Kerosene,Palmolien Oil and Red gram Dal through Fair Price shops Under The Public Distribution System at Subsidized rates Through issue of computerised card, consumer affairs, monitoring of prices of essential Commodities, distribution of LPG Connections to BPL women (Deepam Scheme), Enrollment under Uid (Aadhaar) etc. Andhra Pradesh State Civil Supplies Department Provide all information through online like a Ration Card, LPG Connections,Deepam Scheme, Meeseva Services, Ration Card Status through their Official Website http://www.apcivilsupplies.gov.in/ . The facility for the"Compliant Registration" also provide through online to their website. Andhra Pradesh State Citizens who are having any issues with their Ration Card, LPG Connections, Fire Price Shop etc.Citizens Can Register their Complaint through online. 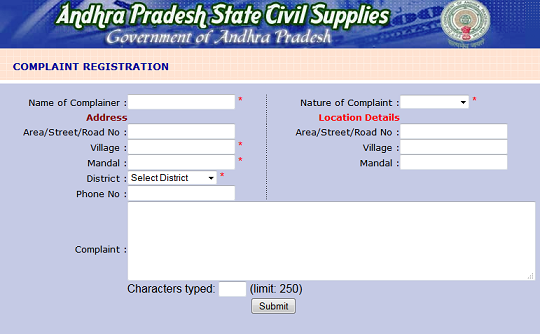 this facility enables one to lodes Complaints online with Andhra Pradesh State Civil Supplies. the Citizens should enter their Name, Village,Mandal, Districts and Name of the Shop for lodging the Complaint. How To Submit 'Compliant Registration' Through online ? 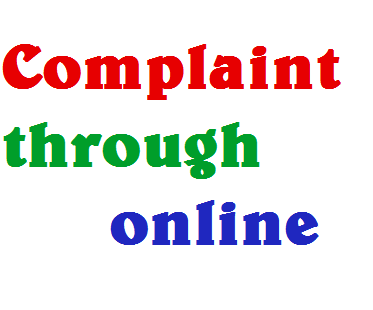 2.Than Click on "Online Complaints Registrations" lift Side of Web page. 4. Now fill the Online Complaint Registration forms following details. 5.After filling 'online Complaint Form' Click on 'Submit Button'. 6. Get Application Number for future assistance.